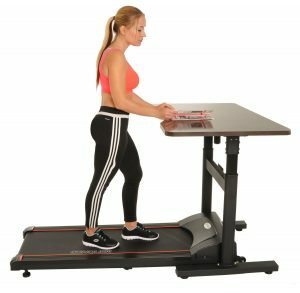 Conquer’s brand new design electric treadmill standing and walking desk is a great combo of a standing desk with adjustable height feature and a solid treadmill that you can walk on at low speeds. It offers a very large working area on the desk and the treadmill runs quietly so you’re not disturbed by the machine noise. Height can be automatically adjusted between 35.5 and 52.5 inches. You can also adjust the speed of the treadmill between 0.6 and 4 miles per hour, so you will not really be jogging or running on it. This is for walking at slower or faster pace while you’re working at the desk. You can also choose to stand still on the treadmill without walking as walking rather than sitting down is claimed to burn extra 40-50 calories per hour depending on your weight. You will, of course, burn more calories if you walk even at slow speed. Sitting in an office or home, especially in front of the computer all the time is bad for you and you will put on weight very quickly even if you don’t eat a lot. You will find the LCD-backlit display panel with four small screens for each of the calories, distance in miles, speed mph and time indicators, Speed up and down arrows and 1, 2, 3 and 4 buttons, Height up and down arrows, Start and Stop buttons. The treadmill is rather compact but is fine for people of any size as it is just for walking purposes while you’re studying or working at the desk. The Conquer Treadmill Desk is a good quality one and includes a stable and solid frame. The workspace area that this treadmill desk offers is 47.5 x 27.5 inches, so it is pretty large. This is a lightweight and robust exercise treadmill with thin steel and should last you a long time in normal use. The unit is shipped unassembled but there aren’t many parts to assemble and should not take you long to put it together even if you’re on your own. Some of the other walking and standing desk treadmills on the market can cost several thousands of dollars. This one is at the lower end of the spectrum and you can’t really expect the same set of features and the bells and whistles on this model. But in its category it seems to offer decent value for money, is easy on the eyes, reliable, solid, strong, stable and quiet. And in terms of pricing, it is neither cheap nor too expensive.